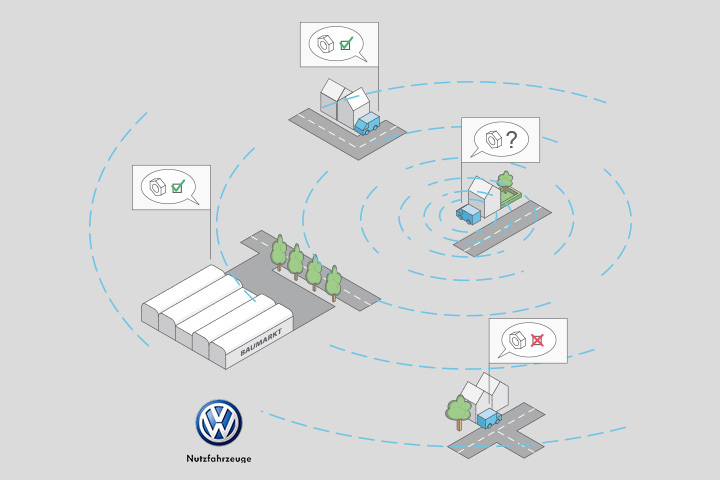 Within the framework of the project “Urban Logistic” from Volkswagen Nutzfahrzeuge, we got asked to develop narrative scenarios which enable an open perspective to possible futures related to urban mobility. *Please click here to get to the scenario process. Additional, marketing and product strategy from Volkswagen formulated the question, how can the commercial transport within the so called “last mile” of cities be different and better organised? It was explicit to consider mobility as a whole. Based on our developed positiv scenario “Digital humanism”, (which pictures an in every aspect connected world which however has accomplished to tackle “Big data” in terms of information technology and legitimately, so that everybody can decide at which time he wants to be on- or offline), we designed the system “ToolConnect”. 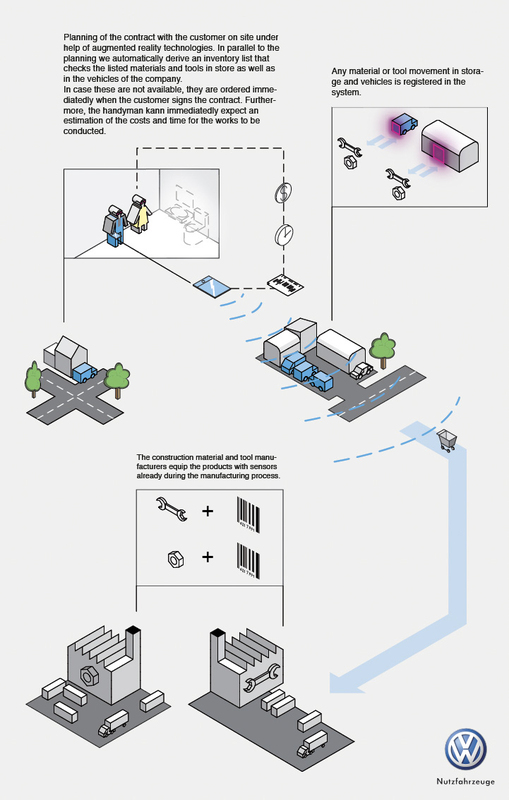 It illustrates how intelligent future construction projects can be managed if everything is connected in real time. The Smart Factory and Production 4.0 will be the standard of the near future. The foundation for that will be the Internet of Things. That means, everything will be equipped by sensors. Consequently, everything can communicate with everything, along the lines of “The screw in the Smart Factory can tell the molding cutter which thread it needs.”. Today, the technology is advanced enough to be available as RFID chips in a size of only micrometers. The logistics domain already optimizes their processes with them. For handymen companies, this means in the near future they will get a real-time overview of their tools and materials which will be equipped with sensors. Under these circumstances it is possible to give the worker a real-time overview of his inventory by providing them with intelligent vehicles that register the loading and unloading of tools and materials. The warehouse is also enhanced by this technology such that it registers any change to its inventory. 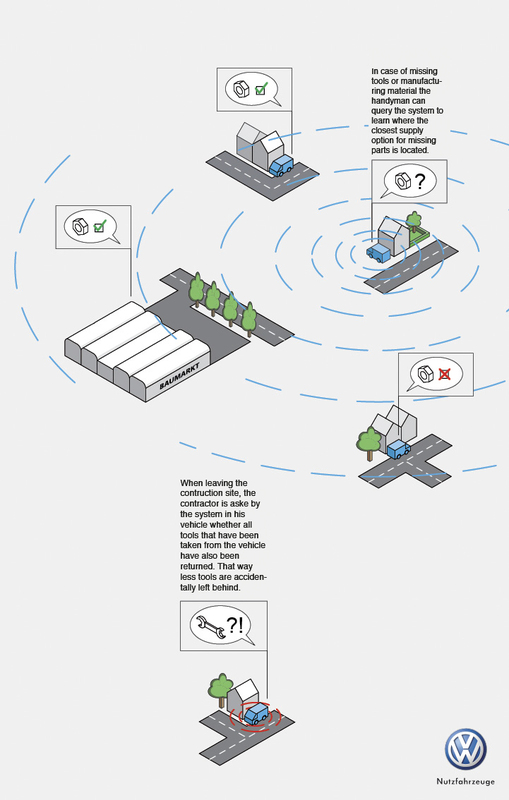 The worker uses a smart device to keep realtime control of their resources. Our goal was to provide a system that adheres to the specific requirements and needs of handyman workshops and makes them competitive for the future. Professional workshops shall be supported in organizing their work processes significantly more efficient than today. This is necessary to confidently step up against the DoItYourself movement, which could otherwise lead to a serious competitor for professional workshops. We are very happy that our project was selected to be shown at internal events from Volkswagen.